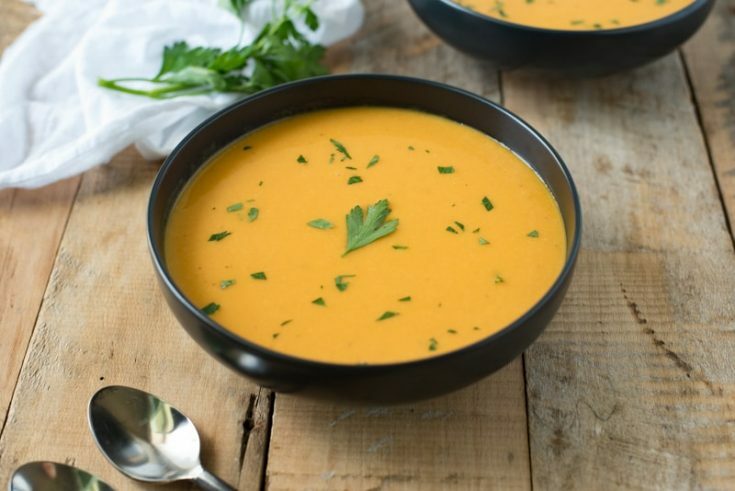 Thai Butternut Squash Soup is the combination of delicious, seasonal butternut squash, along with the amazing flavors of fresh ginger, Thai curry paste and coconut milk. This is will be your new favorite fall and winter soup. Not the flavors you usually find when you eat a butternut squash soup. This is curry butternut squash soup taken to the next level because the Thai flavors work so well with the butternut squash! This soup is a combination of east meets west for the fall and winter season. If you’re following a gluten-free diet, there’s no need to miss out because this soup is also gluten-free! Butternut squash not only works well as a soup. 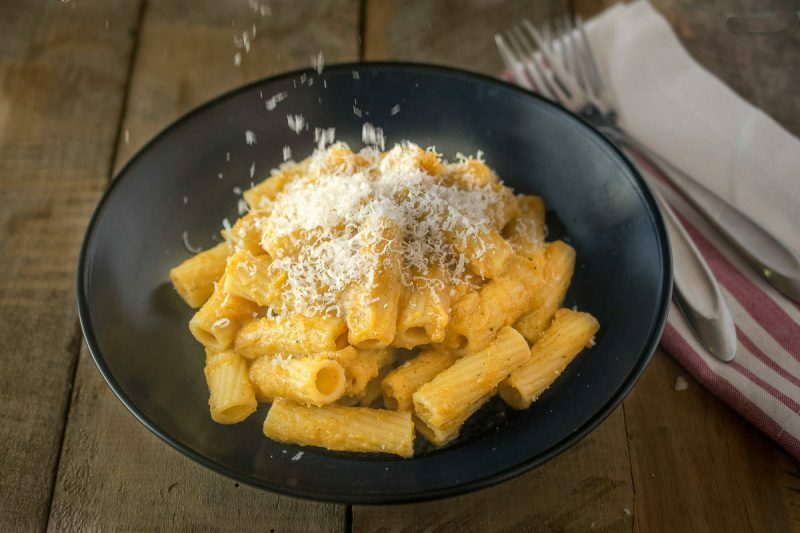 Because of it’s naturally creamy texture, I made it into a dairy free pasta sauce that can also be made into a soup in creamy butternut squash pasta. By adding red Thai curry paste and coconut milk, transforms this soup into a rich and decadent dish you will fall in love (can you fall in love with a soup?). Made in under 20 minutes, you can make this soup and either freeze it or have in on hand in the fridge. Perfect for those chilly nights when you get home from work and want something warm and comforting when you’re in your PJ’s and ready to catch-up all your DVR shows. You know what I’m talking about, this is that dish! Just add a piece of crusty bread and you have a fast and easy dinner. 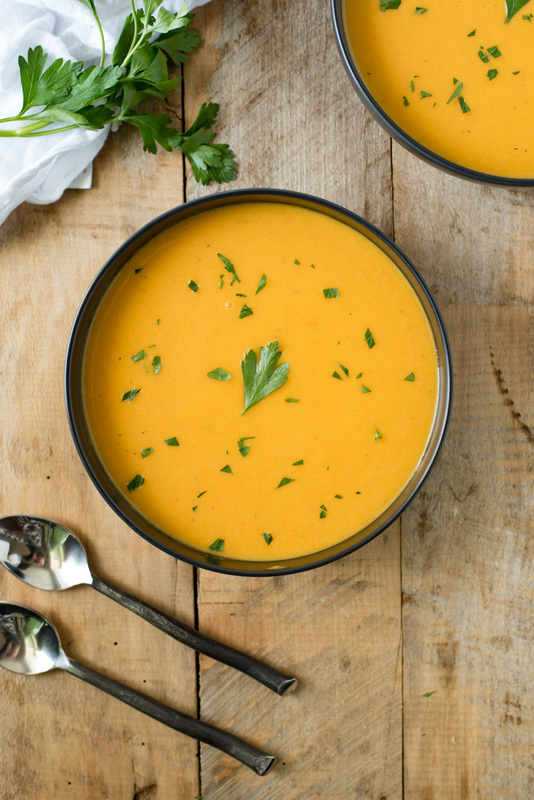 This Thai Butternut Squash Soup can also be made in the slow cooker. Sauté the onions, garlic & ginger (per step 2 of the recipe). Transfer to a slow cooker along with all the other ingredients, mix well, cover and cook on high for 2-3 hours or low for 4-6 hours. If you’ve tried this Thai Butternut Squash Soup or any other recipe on the blog then don’t forget to rate the recipe and let me know how you got on in the comments below. I love to hear from my readers! You can also FOLLOW ME on FACEBOOK, TWITTER, INSTAGRAM and PINTEREST to see daily recipe updates. 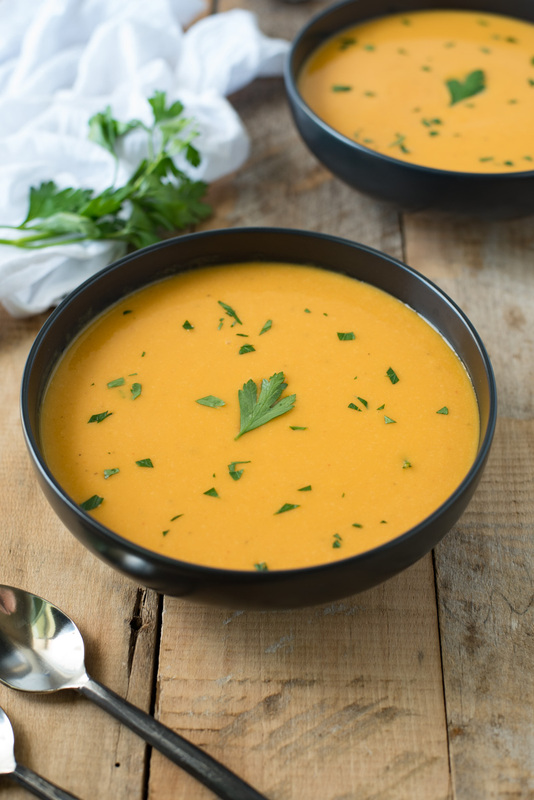 Thai Butternut Squash Soup is the combination of delicious, seasonal butternut squash, along with the amazing flavors of fresh ginger, Thai curry paste and coconut milk. To a heavy soup pan or Dutch oven add the olive oil and butter over medium heat. Add the onion to the pan and cook, stirring occasionally until softened, about 5 minutes. Add the garlic and ginger, stir and cook for 1 minute. Stir in the red curry paste, coconut milk, vegetable stock, butternut squash salt and pepper. Bring to a simmer, cover and cook for 10 minutes until the squash is tender. Use an immersion blender and blend until smooth or add the soup to a blender and blend in batches. Taste for seasoning and add if needed. Serve immediately garnished with parsley. So right time for this soup. Thank you so much ! Pinning ! I love butternut squash soup and we often make ours Thai too. It’s such good healthy autumnal comfort food! I’ve been on the look out for new soup recipes with the cooler weather – this just got added to the list. 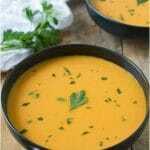 Love the twist on a classic butternut squash soup. Sounds amazing. This is a truly amazing twist on traditional butternut squash soup. Thai flavors are one of my favorites and I bet they are amazing in this soup! This sounds and looks absolutely delicious – what a gorgeous color! I would have never thought of adding Thai flavors to butternut squash, but it really sounds very good. I want to make a huge batch to freeze half and feel prepared for a rainy day!